America's economic sore spot: Do black jobs matter? #BlackLivesMatter has become a rallying cry in America. An equally troubling question facing the nation is do #BlackJobsMatter? The unemployment rate for whites is 4.4%. It's more than double that -- 9.2% -- for African-Americans. 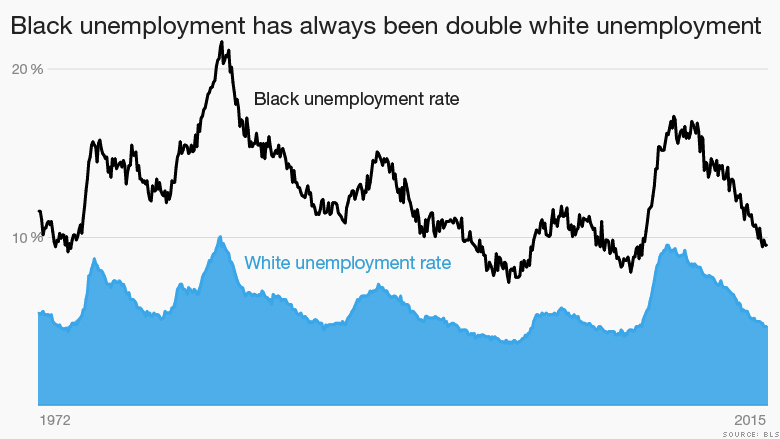 It's become accepted that the African-American unemployment rate is "always" twice that of whites. It's been this way for decades -- ever since the government started keeping these statistics by race. There was hope that the election of President Barack Obama would usher in a new era. If a minority could hold the highest office in the country, surely other milestones could, and would, come. And there have been others -- Viola Davis just became the first African-American woman to win the Emmy award for lead actress in a drama. Beyonce and Jay-Z have become one of the most powerful couples in entertainment, and black CEOs like Arnold W. Donald of cruise line company Carnival (CCL) are leading thriving businesses. Despite these high-profile achievements, the overall black-white job gap isn't closing. Last week, the latest report came out on American jobs. Some articles celebrated the news that the black employment ratio hit a 7-year high. In other words, more blacks are working again. 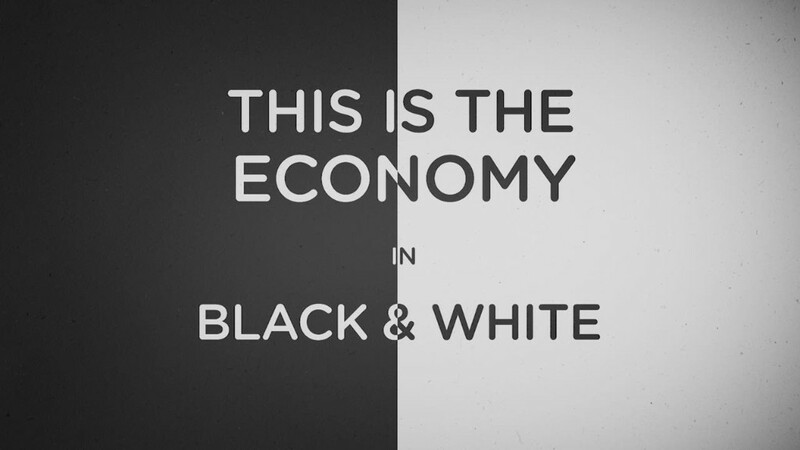 But the recent gains have done nothing to lessen the disparity between black and white workers. In fact, depending upon how you look at the data, it's getting worse. "The racial gap in unemployment is a profound index of the degree of employment discrimination in the nation's labor markets," says William Darity Jr, a Duke University professor and director of the Samuel DuBois Cook Center on Social Equity. Blacks don't just struggle to get jobs, they fight to get paid the same as their white peers. Black households take home about 62 cents for every $1 a white family does. That's been true since the 1960s. Less income means less money to spend on health care, education or starting a business. There are lots of explanations for why this is. Some point to more African-Americans having criminal records or that they fewer have college degrees. These are barriers, but even African Americans with degrees that translate into careers lag behind. The fact that African Americans have double the unemployment rate of whites holds true for all levels of education. All the way up to master's and PhD degrees, blacks are still twice as likely to be unemployed. "When blacks 'do the right thing,' it has an imperceptible effect on racial wealth inequality," notes Professor Darity. Blacks with some college education actually have a harder time finding work than whites who haven't even completed high school. If African Americans have a harder time finding jobs -- especially high-paying jobs -- it is perhaps not surprising that they are not able to save and accumulate much wealth. Part of the American Dream is often to buy property -- and be able to pass that house or some money to kids or grandkids to give them a little boost. 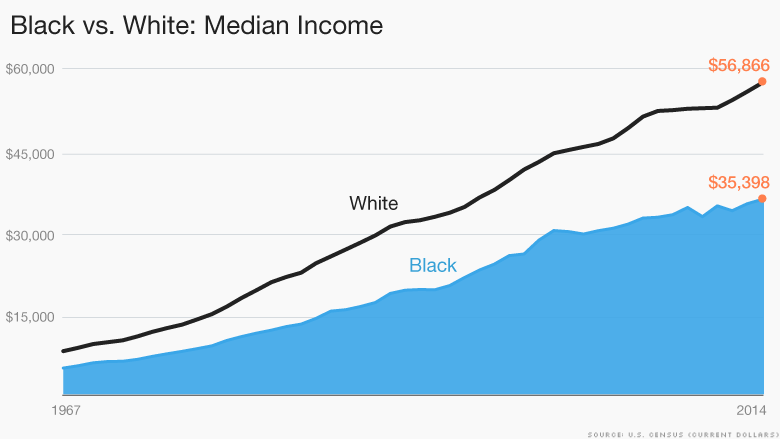 Again, the wealth disparity is vast between black and white families. 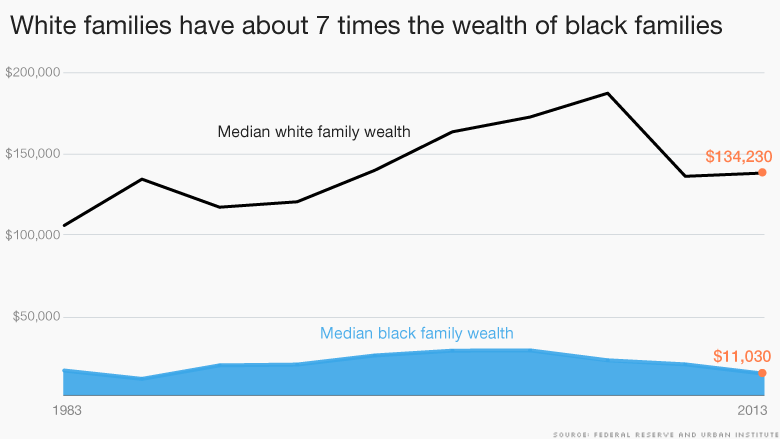 Historically, white families have had 7 times the amount of wealth of black families. More recently -- in 2013 -- that difference has grown to 12 times as much wealth in the hands of white families. The typical white family has over $134,000 in wealth. The typical black family has just $11,000. It's part of the reason the Congressional Black Caucus and the Democrats on the Joint Economic Committee of Congress recently held a forum on "The American Dream on Hold: Economic Challenges in the African American Community." Black jobs and livelihoods are becoming an issue on the 2016 campaign trail. As president, Barack Obama's task when he took office was to try to steer the country out of the Great Recession. But as the economy improves, the focus is shifting to who is left behind. Hillary Clinton vows to "do more to open doors." "We have to get more good jobs," Clinton said recently in South Carolina. "And we do need, in my opinion, a targeted effort at people and communities that have not had the benefits of the recovery thus far." Republicans have also talked about the need for more people to share in America's economic gains. Ted Cruz has used an African-American single mom from Chicago named Sabina Loving as an example of the people he's fighting for. "We've gotta turn the economy around for people who are struggling," Cruz said.